The New Testament consists of 27 separate books, written mainly, though not exclusively, by Apostles of the Lord Jesus Christ. These books teach and testify of the ministry and Atonement of Jesus Christ and the rise of the early Christian Church. The Bible﻿—the Old and New Testaments﻿—has influenced more people than any other book ever written. Elder L. Tom Perry (1922–2015) of the Quorum of the Twelve Apostles stated that the New Testament “is the centerpiece of scriptural history, just as the Savior Himself should be the centerpiece of our lives. We must commit ourselves to study it and treasure it!” (“The Sabbath and the Sacrament,” Ensign or Liahona, May 2011, 6). This chapter contains a brief overview of the historical period between the Old and New Testaments, a short summary of the contents of the four Gospels with emphasis on the final week of the Savior’s mortal life, a brief history of how the New Testament came to be, information about the Joseph Smith Translation, and statements on the importance of the New Testament for The Church of Jesus Christ of Latter-day Saints and its members. Knowing some of the main historical events between the end of the Old Testament era and the beginning of the New Testament era helps us better understand the people and circumstances we encounter as we begin to read the New Testament. The time period between the testaments can be divided into the Persian, Hellenistic, Hasmonean, and Roman periods. Persian period. Around 539 B.C., Cyrus of Persia conquered Babylon and permitted Jews who had been brought there as captives between 606 and 586 B.C. to return to Judea (see Ezra 1; Bible Dictionary, “Cyrus,” “Persia”). The Jews who chose to return brought the Aramaic language with them from Babylon, and by New Testament times it had replaced Hebrew as the spoken language of most Jews. With permission from Persian rulers, the Jews rebuilt the temple in Jerusalem (around 516 B.C.). Old Testament books written during the Persian period include Daniel, Esther, Ezra, Nehemiah, Haggai, Zechariah, and Malachi. The last Old Testament book, Malachi, was written by the prophet Malachi about 430 B.C. After Malachi, scribes, temple priests (led by the Aaronic high priest), and rabbis gradually replaced prophets as spiritual leaders of the Jewish people. Hellenistic period. Judea was one of the conquests of Alexander the Great (336–323 B.C. ), bringing the influence of Hellenistic (Greek) culture to the land of the Jews (see Bible Dictionary, “Alexander”). Many Jews left Judea to live in other Greek cities, furthering the dispersion of the Jewish people. The presence of Jewish communities and synagogues throughout the Mediterranean world later facilitated the spread of Christianity in the first century A.D. (see Bible Dictionary, “Diaspora,” “Dispersion”). New occupations, such as tax collectors and hired day laborers, found their way into Jewish society during the Hellenistic period. The Jewish governing council, the Sanhedrin, was formed during this time. In the third century B.C., the Old Testament began to be translated into Greek, which had become the common language of the Mediterranean world. The finished translation, known as the Septuagint, was the scripture commonly used during New Testament times. Most of the quotations of the Old Testament found in the New Testament are taken from the Septuagint. This Greek translation of the Jewish scriptures later proved to be of special value in spreading the Christian faith to the Gentile world, for it made the religion of the Jews available to the civilized world (see Bible Dictionary, “Hellenists,” “Septuagint”). Following the death of Alexander (323 B.C. ), his generals fought to gain control of his empire. Seleucus Nicator seized control of Syria, Asia Minor (or Turkey), and Greece, while Ptolemy took control of Egypt. Judea lay directly between the realms of the two rivals and changed hands several times during the ensuing years. Hasmonean period. The Seleucid ruler Antiochus IV Epiphanes (descendant of Seleucus Nicator) began his rule of the Judean area in 175 B.C. (see Bible Dictionary, “Antiochus Epiphanes”). Believing that a complete Hellenization of the region would bring stability to his kingdom, he banned Judaism completely, including Sabbath observance and circumcision. He made the possession or reading of the Torah (see Bible Dictionary, “Torah”) punishable by death. In Jerusalem, the temple altar was desecrated with the sacrificing of swine, and an altar to pagan gods was placed over the temple altar. Though calculated to embarrass Jews and discourage observance of Jewish law, these atrocities outraged the Jewish community. In response, a priest named Mattathias, of the family of Hasmon, and his five sons led a Jewish revolt in 167 B.C., called the Maccabean revolt (see Bible Dictionary, “Maccabees”). 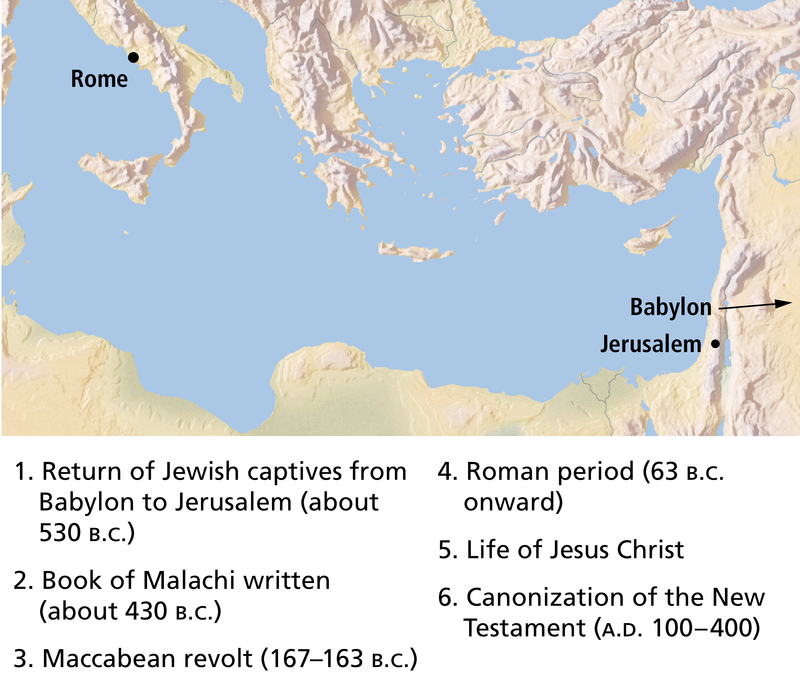 By 165 B.C., Maccabean forces had recaptured Jerusalem and rededicated the temple. The Feast of Dedication (Hanukkah) mentioned in the New Testament commemorated this momentous event (see Bible Dictionary, “Feasts”). Maccabean leaders succeeded in establishing an independent Jewish state for the first time in over 440 years. Simon Maccabeus, a son of Mattathias, became both high priest and governor of Judea, thus establishing the Hasmonean dynasty. Roman period. Over time, Hasmonean leadership degenerated into a corrupt political entity. In 63 B.C., at a time when two Hasmonean brothers were vying for power, the Roman general Pompey invaded Jerusalem, and the land of the Jews fell under the control of the Roman Empire (see Bible Dictionary, “Roman Empire”). At the time Jesus Christ was born, the Roman-appointed ruler of Judea was the Jewish king Herod the Great, who, threatened by reports of the birth of the Messiah, ordered the slaying of the children of Bethlehem age two and under (see Matthew 2:1–18). A powerful, ruthless leader who was unpopular with his people, Herod attempted to win their favor by undertaking massive building projects, especially the rebuilding of the Jerusalem temple, which continued long after Herod’s death and throughout the duration of Jesus Christ’s ministry (see Bible Dictionary, “Herod,” “Temple of Herod”). After Herod’s death in 4 B.C., his lands were divided between three of his sons. They ruled as tetrarchs (Greek meaning “rulers of a part or portion”) and not as full-fledged kings like their father. One of them, Herod Antipas, ruled Galilee and is the Herod mentioned most frequently during the time of Jesus Christ’s ministry. Beginning in A.D. 6, after one of Herod’s sons was deposed, leaders of the Roman Empire began to appoint governors over the province of Judea. They were first called praefectus and then procurators from the time of Emperor Claudius (A.D. 41–54) onward (see Acts 11:28). Pontius Pilate was appointed governor in A.D. 26 and ruled until A.D. 36. Throughout the New Testament period, the office of high priest﻿—the official head of the Aaronic or Levitical Priesthood﻿—was filled by corrupt men. During the Hasmonean era, the legitimacy of the office was increasingly challenged. Under the Seleucid ruler Antiochus IV, the office was sold to the highest bidders, and Herod the Great relegated the office to a marginal role. But with the coming of the Roman governors, the high priest was given greater power so that the office could become a pro-Roman aristocracy. The high priest during Jesus Christ’s adulthood was Caiaphas, who was a son-in-law of Annas (see John 18:24). Annas was high priest from A.D. 6 to 15, and Caiaphas ruled from A.D. 18 to 36. Annas was so powerful that several of his sons went on to become high priests. The Roman period is generally regarded as ending in A.D. 324. The events of the intertestamental period help us understand the great desire many Jews felt for the coming of the promised Messiah. After centuries of conquest and humiliation, many felt desperately that only the Messiah could rid them of foreign oppressors and reclaim their national dignity. Messiah. An Aramaic and Hebrew word meaning “anointed one.” In ancient Israel, prophets, kings, and priests were anointed with oil, indicating they were chosen and set apart by God. The term Messiah came to indicate a specific king of Israel of the lineage of David who would one day come to save his people. The Greek equivalent of Messiah is Christos, from which comes the title Christ. At the time of the New Testament, the people were expecting the coming of the Messiah. Galilee. The area north of Jerusalem, bordering on the north and west of the Sea of Galilee. Jesus was raised in the small Galilean village of Nazareth and spent the majority of His mortal ministry teaching in Galilean towns and villages such as Capernaum, Cana, Bethsaida, Nain, and others. Judea. The area west of the Dead Sea and surrounding Jerusalem. The Savior was not as readily accepted here as in Galilee, particularly by the Jewish leaders, who were the chief priests, scribes, and elders. Samaria. The area west of the Jordan River and between Judea and Galilee. The Samaritans were descendants of Israelites and foreigners who intermarried and inhabited the land following the Assyrian conquest in the eighth century B.C. (see 2 Kings 17:24–41). The animosity between Samaritans and Jews dated back to at least the Persian period. Jews traveling between Judea and Galilee often traveled a longer route near the Jordan River in order to avoid passing through Samaria. Pharisees. A group of pious Jews whose name denotes separatists﻿—in particular, they separated themselves from Gentile impurities. Pharisees sought strict observance of the law of Moses and Jewish rituals. They upheld the authority of oral tradition as being of equal value to written scripture. In general, the Pharisees were a major source of opposition to Jesus Christ. Sadducees. An elite group composed of aristocratic high priestly families who had gained prominence during the Hasmonean period. Though relatively few in number, they held considerable power, especially over the administration of the temple in Jerusalem. They opposed Jesus Christ for His cleansing of the temple, which they regarded as an affront to their authority. They rejected traditions and beliefs not found in the written law of Moses, putting them at odds with the Pharisees and many other Jews. In particular, they rejected belief in angels, immortality, judgment, and resurrection. These beliefs were the cause of much of the animosity they had toward the Savior. Sanhedrin. This Greek term means “council.” There were many Sanhedrins in different areas of Jewish life. When the term (or its English equivalent “council”) is used without qualification in the New Testament, however, it generally refers to the Great Sanhedrin that was headquartered in Jerusalem. This Jewish council regulated the internal affairs of the Jewish nation. It consisted of 70 members and a high priest who presided over the council. Its membership was drawn from the Jewish elite﻿—chief priests, scribes, Pharisees, Sadducees, and elders. Though Rome retained political power, the Sanhedrin was allowed jurisdiction over the religious laws of Judea as long as it was able to keep the Jews under control. Scribes. Educated men who made their livelihood as record keepers and as copyists of the scriptures. They supplied scriptures to the growing number of synagogues and also became interpreters and teachers of the law of Moses. Synagogue. Synagogues were Jewish congregations, or the actual buildings where Jews assembled for prayer and worship on Sabbaths, festivals, and other holy days. The institution of the synagogue became pronounced during the Babylonian exile and the intertestamental period as Jews sought ways to worship the Lord while separated from His temple. Remains of several synagogues dating to New Testament times have been discovered. Jesus and His Apostles taught in such synagogues. Scriptures. The scriptures used by Jews in Jesus’s day were sometimes divided into three main categories. The Torah, also known as “the Law,” consisted of the five books of Moses (the first five books of the Old Testament). The Prophets referred to a collection of books by and about prophets and included the historical books from Joshua through 2 Kings as well as the books of Isaiah, Jeremiah, Ezekiel, and the 12 “minor prophets” (Hosea through Malachi). The Writings were a collection that included literary works (Psalms, Proverbs, and Job), “the five scrolls” (Song of Solomon, Ruth, Lamentations, Ecclesiastes, and Esther), the book of Daniel, and the historical books of 1 and 2 Chronicles. What categories of Jewish scripture are mentioned in these verses? Elder Bruce R. McConkie (1915–85) of the Quorum of the Twelve Apostles summarized the contents of the New Testament: “The New Testament … recounts the fulfillment of the ancient promises; tells of the birth and ministry and atoning sacrifice of the Promised One; expounds the saving doctrines of his everlasting gospel; records the growth and expansion of the gospel cause in the meridian day; predicts the universal falling away from the faith once delivered to the saints; promises a glorious restoration of the gospel in the last days; and foretells, in graphic and dramatic imagery, the events preceding, attending, and succeeding the Second Coming of the Son of Man. Its chief purpose is to bear witness of Christ” ( A New Witness for the Articles of Faith , 392). The Gospels of Matthew, Mark, Luke, and John were written not as biographical sketches of Jesus Christ but as testimonies that He was the Messiah, the Son of God. Rather than revealing a day-to-day story of the life of Jesus Christ, the Gospels emphasize His atoning mission, as told in the context of His mortal life and ministry. The public ministry of Jesus Christ spanned about three years; however, the four Gospels relate information about a small number of specific days of the Savior’s life. John stated that the authors were selective in what they recorded (see John 21:25). Inasmuch as the Atonement of Jesus Christ is at the heart of our Heavenly Father’s plan for the redemption of His children, it is important to recognize the emphasis that Matthew, Mark, Luke, and John each gave to events of the Atonement﻿—the suffering in Gethsemane, the Crucifixion, and the Resurrection of Jesus Christ. Through careful narrative, the inspired Gospel writers showed how these sacred events were central to Jesus Christ’s mortal ministry. And, as recorded by John, “These are written, that ye might believe that Jesus is the Christ, the Son of God; and that believing ye might have life through his name” (John 20:31). The first two rows on the overview chart show that Matthew, Mark, and Luke share much of the same content. “The records of Matthew, Mark, and Luke present a somewhat similar collection of materials and have considerable phraseology in common, as well as similar main points, and thus are sometimes labeled as the ‘Synoptic Gospels’ (meaning ‘see-alike’). Even so, each is unique and has much detail that is not shared by the others. John’s record is quite different from the other three in vocabulary, phraseology, and presentation of events” (Bible Dictionary, “Gospels”). The earliest surviving New Testament text dated to the first half of the second century A.D. There are no surviving autographs of New Testament books﻿—original manuscripts written by the author. The earliest full manuscripts of individual New Testament books date to around A.D. 200, while the earliest collections of all the books of the New Testament date to the fourth century. The Apostasy began to occur in the early Christian Church while the Apostles were still alive (see Acts 20:29–30; 1 Corinthians 1:10–13; Galatians 1:6–8; 2 Peter 2:1–3; 3 John 1:9–10; Jude 1:3–4, 18–19). After apostolic authority was taken from the earth through the deaths of the Apostles, which resulted in the loss of priesthood keys, the Apostasy accelerated, and diverse and competing groups of Christians claimed scriptural support for their beliefs. As debates over the authenticity and value of various texts intensified, Christians felt a need to gather together an accepted collection of authentic Christian writings. It was generally understood that some writings were authentic and others were questionable, with some being of greater value than others. In time, Christian leaders of the third and fourth centuries determined which texts would be included in the accepted canon of scripture﻿—based on whether texts had known apostolic authority, continuous and widespread support among Christian communities, and an absence of false teachings. Using these criteria, in A.D. 367 Athanasius of Alexandria recommended a list of the 27 books currently in the New Testament. This collection was confirmed by the third council of Carthage in A.D. 397. From the first century, Christians began producing copies of New Testament texts in codex form﻿—a “book” format with separate pages bound together﻿—rather than scroll form, which had been the customary way to write Old Testament texts. This may have been a factor in the development of the collection of books now known as the Bible. The word Bible derives from the Greek biblia and literally means “books.” With a codex, a collection of multiple books could be created in one bound volume. The earliest complete text of the New Testament is the Codex Sinaiticus, written in the fourth century A.D.
Once the 27 books of the New Testament were canonized, they were translated and organized into the Bibles we use today. Following is an overview of a few of the major translations of the Bible throughout history. As this overview makes clear, many of the people responsible for bringing the Bible to the four corners of the earth “sacrificed, even to the point of death, to bring the word of God out of obscurity” (D. Todd Christofferson, “The Blessing of Scripture,” Ensign or Liahona, May 2010, 32). The Vulgate: Jerome’s Latin Translation. (In Latin, vulgate means “common.”) When the need arose to take the scriptures into Latin-speaking areas, such as northern Africa, Latin translations were made of the Greek Septuagint (Old Testament) and the New Testament. However, because these translations were not closely controlled, church leaders soon became concerned about the many corruptions and variances in the separate texts. To address this problem, Pope Damasus in A.D. 383 commissioned his secretary, Jerome, a very able scholar in Greek and Latin, to produce a new suitable Latin translation. In the preface to his Vulgate translation of the New Testament, Jerome wrote a letter to Pope Damasus, describing the problem with creating a new translation: “For if we are to pin our faith to the Latin texts, it is for our opponents to tell us which; for there are almost as many forms of texts as there are copies. If, on the other hand, we are to glean the truth from a comparison of many, why not go back to the original Greek and correct the mistakes introduced by inaccurate translators, and the blundering alterations of confident but ignorant critics, and, further, all that has been inserted or changed by copyists more asleep than awake?” Jerome’s words describe the same problem Joseph Smith dealt with as he created the Joseph Smith Translation of the Bible. Jerome’s Latin Bible, known as the Vulgate, eventually supplanted all other translations and became the Bible of the western world for close to a thousand years. The Vulgate was given official sanction at the Council of Trent (1545–63). It has been said that the Vulgate was the pillar that preserved Europe’s spiritual and intellectual heritage against attacking waves of northern barbarism. The Luther Bible: Martin Luther’s German translation. The history of the Bible’s translation into German began in A.D. 348. To escape religious persecution by a Gothic chief, a Catholic priest named Wulfila (sometimes known as Ulfilas) fled with his followers from Germany to what is now northern Bulgaria. There, Wulfila translated the Bible from Greek into the Gothic dialect. This version established much of the Germanic Christian vocabulary that is still in use today. In the late 15th and early 16th centuries, a number of German translations of the Bible were produced, but the German translation that had the greatest influence was the one produced by Martin Luther. Luther was a German priest and theologian, whose break from the Catholic church helped to fuel the Protestant Reformation. He disagreed with many church practices that he felt did not accord with the teachings of scripture, and he came to regard the Bible rather than the church as the reliable source of authority for Christians. After publicly announcing his disagreements with the church in 1517, Martin Luther began to work on translating the Bible into German. He completed work on the New Testament in 1522 and published his translation of the entire Bible in 1534. This translation into the vernacular of German-speaking peoples was one of the most important acts of the Reformation. It not only gave the German people access to the Bible, but it influenced German culture, standardized German religious and literary language, and helped create national unity. Its influence on the German language is comparable to the influence the King James Bible had on the English language. The Luther Bible was also one of the factors leading to the production of the King James Bible. A 2017 revision of the Luther Bible is widely used today. It is of interest to know that the Prophet Joseph Smith possessed a copy of the New Testament in several languages, including Martin Luther’s translation of the Bible into the German language. He compared the various translations of some New Testament passages and felt that Luther’s translation was very good (see History of the Church, 6:307). John Wycliffe’s English translation. A century and a half before Martin Luther, the work of translating the Bible into English was pioneered by John Wycliffe. One of the most prominent scholars of his day, Wycliffe loved the scriptures and was troubled by the ignorance of scripture that he observed among many clergymen and lay persons alike. Like Luther, he grew disillusioned with the church and concluded that the only accurate guide the people still had was the Bible; thus he embarked on the arduous task of taking “God’s law” to his countrymen in the English language they understood. Working from Jerome’s Latin translation, Wycliffe and his associates completed an English translation of the New Testament in 1380 and portions of the Old Testament in 1382. Approximately 30 years after his death, he was denounced as a heretic. Later, in 1432, by order of Pope Martin V, his bones were dug up and burned and the ashes scattered. His followers, the Lollards, were persecuted long after his death. “He sought the approval of church authorities to prepare a translation of the Bible in English so that all could read and apply the word of God. It was denied﻿—the prevailing view being that direct access to the scriptures by any but the clergy threatened the authority of the church and was tantamount to casting ‘pearls before swine’ (Matthew 7:6). “ … Within three years of Tyndale’s death, God did indeed open King Henry VIII’s eyes, and with publication of what was called the ‘Great Bible,’ the scriptures in English began to be publicly available. Tyndale’s work became the foundation for almost all future English translations of the Bible, most notably the King James Version” (“The Blessing of Scripture,” Ensign or Liahona, May 2010, 32). Tyndale’s was the first English translation of the Bible to draw directly from both Hebrew and Greek texts and the first English translation to take advantage of the recently invented Gutenberg printing press, which allowed for wide distribution. King James Version. From 1604 through 1611, a team of approximately 50 translators commissioned by King James I of England (1566–1625) worked on a new English translation of the Bible, which became known as the King James Version, sometimes called the Authorized Version. The translators used Tyndale’s text and consulted other helpful resources, including other translations of the Bible in English, Spanish, French, German, and Italian; numerous scholarly works; and manuscripts of Bible texts in Hebrew, Aramaic, and Greek. The resulting translation had a tremendous influence on the English language, similar to the impact of the Luther Bible on German. It was the King James Version of the Bible that was studied and used by the Prophet Joseph Smith. Its vocabulary and style of language can be seen throughout the Book of Mormon and the Doctrine and Covenants (see D&C 1:24). The King James Version is of lasting value in the restored Church of Jesus Christ of Latter-day Saints. In August of 1992, the First Presidency of the Church﻿—Ezra Taft Benson, Gordon B. Hinckley, and Thomas S. Monson﻿—released a statement on the King James Version of the Bible. Part of the statement reads: “While other Bible versions may be easier to read than the King James Version, in doctrinal matters latter-day revelation supports the King James Version in preference to other English translations. All of the Presidents of the Church, beginning with the Prophet Joseph Smith, have supported the King James Version by encouraging its continued use in the Church. In light of all the above, it is the English language Bible used by The Church of Jesus Christ of Latter-day Saints” (“First Presidency Statement on the King James Version of the Bible,” Ensign, Aug. 1992, 80). Reina-Valera Spanish translation. As early as 1490, a translation was made of the four Gospels from the Latin Vulgate into Spanish. In 1543 Francisco de Enzinas, a Protestant, translated a complete New Testament and was imprisoned for what were considered perverse readings. In 1569 Casiodoro de Reina produced and published a translation of the entire Bible in Spanish. Reina had been a monk, but he left the Catholic church after hearing the message of the reformers. Like many other reformers and Bible translators, he faced persecution and threats on his life﻿—King Philip of Spain put a price on Reina’s head in 1564﻿—and he spent much of his life in exile. One of Reina’s colleagues, Cipriano de Valera, worked for 20 years to revise and improve Reina’s translation, and in 1602 at the age of 70, he published what has become known as the Reina-Valera translation. This version has become the classic translation of the Bible in Spanish. It has been as central to the understanding of the scriptures in Spanish as the King James Version has been in English. Over the centuries, numerous revisions have been made to the Reina-Valera version. Reina and Valera are remembered with honor as “two men in whose hearts existed the noble purpose of giving to Spain the Bible in their mother tongue” (Eduardo Balderas, “How the Scriptures Came to Be Translated into Spanish,” Ensign, Sept. 1972, 27). In 2009, under the direction of the First Presidency and the Quorum of the Twelve Apostles, The Church of Jesus Christ of Latter-day Saints produced an LDS edition of the Reina-Valera version, with updated language, new chapter headings, footnotes, cross-references to all the standard works of the Church, maps, and other study aids (see “Church Publishes LDS Edition of the Holy Bible in Spanish,” Ensign, Sept. 2009, 77–78). How do the translations of the Bible described here help fulfill the promises made in these verses? “It is a miracle that the Bible’s 4,000 years of sacred and secular history were recorded and preserved by the prophets, apostles, and inspired churchmen. “It is a miracle that the Bible literally contains within its pages the converting, healing Spirit of Christ, which has turned men’s hearts for centuries, leading them to pray, to choose right paths, and to search to find their Savior. “The Holy Bible is well named. It is holy because it teaches truth, holy because it warms us with its spirit, holy because it teaches us to know God and understand His dealings with men, and holy because it testifies throughout its pages of the Lord Jesus Christ” (“The Miracle of the Holy Bible,” Ensign or Liahona, May 2007, 80). What do these scriptures teach about Latter-day Saint belief in the Bible? The Bible “is one of the pillars of our faith, a powerful witness of the Savior and of Christ’s ongoing influence in the lives of those who worship and follow Him. The more we read and study the Bible and its teachings, the more clearly we see the doctrinal underpinnings of the restored gospel of Jesus Christ. We tend to love the scriptures that we spend time with. We may need to balance our study in order to love and understand all scripture. “I bear solemn witness that we are true and full believers in the Lord Jesus Christ and in His revealed word through the Holy Bible. We not only believe the Bible﻿—we strive to follow its precepts and to teach its message” (“The Miracle of the Holy Bible,” 82). “The translation process was a learning experience for the Prophet, and several sections of the Doctrine and Covenants (and also other revelations that are not published in the Doctrine and Covenants) were received in direct consequence of the work (D&C 76–77; 91). Also, specific instruction pertaining to the translation is given in D&C 37:1; 45:60–61; 76:15–18; 90:13; 94:10; 104:58; 124:89. The book of Moses and the 24th chapter of Matthew (JS﻿—M), contained in the Pearl of Great Price, are actual excerpts from the JST. … The JST to some extent assists in restoring the plain and precious things that have been lost from the Bible (see 1 Ne. 13–14)” (Bible Dictionary, “Joseph Smith Translation”). President Dallin H. Oaks of the First Presidency has stated that the Joseph Smith Translation of the Bible “is a member of the royal family of scripture. … It should be noticed and honored on any occasion when it is present” (“Scripture Reading,” in Plain and Precious Truths Restored, ed. Robert L. Millet and Robert J. Matthews , 13). In the LDS edition of the King James Version of the Bible, short excerpts from the Joseph Smith Translation can be found in the footnotes, while longer revisions are included in the Bible appendix. The Gospels of Matthew, Mark, Luke, and John were written as testimonies of Jesus Christ rather than as comprehensive biographical sketches of His life. How are these testimonies of Christ more important to us than biographies of His life? Why should we be grateful to men like Jerome, Wulfila, John Wycliffe, Casiodoro de Reina, and William Tyndale, even though their translations of scripture are not widely used today? Considering that many men gave their lives as martyrs so we can have the Bible today, what could you do to make the Bible more important in your life? Write one or two paragraphs relating your personal feelings about the New Testament. Include in your writing how you plan to strengthen your testimony of the New Testament. In the library or on the internet, do further research on one of the individuals, Bible translations, or topics covered in the commentary under the heading “Translations of the Bible,” or learn about the translation of the Bible in your native language. Share with your institute class or a friend what you learn and how that knowledge affects your appreciation for the New Testament.